Credit card users are encourage to disipline themself when spending and make their monthly payment promptly. This is because credit card interest rates for outstanding balance is very high. The best practise is to make full payment on all outstanding balance every month. Most banks in Malaysia offered tiered interest as per Bank Negara Malaysia (BNM) credit card interest rate structure which last revised in March 2009. The tiered interest rate structure rewards those who pay their credit card bills promptly. Below are the details on tiered credit card interest rate structure. Based on above tiered interest rate, consumers will enjoy lower, 13.5% interest rate on the 13th month if they pay credit card bills promptly for previous 12 consecutive months. However, some credit card issuers offer lower interest rate. For example interest rate for Affin Bank credit card is only 9.99% pa and AMEX gold credit card in only 9% pa.
Banks require consumers to pay only the minimum which is 5% or RM50 (whichever higher) of total outstanding balance (debt). If they only make minimum payment, it takes about 2 years to clear all the outstanding balance providing that there is no new spending. On top of high interest rate, consumers are also subjected to finance charges if they do not make full payments every month. This means, if they make partial payment, minimum payment or do not make payment on or before the payment due date, finance charges will be imposed from the day the transaction is posted to the card account. To avoid this, consumers have to have full payments prior to due date. They will enjoy interest-free period for retail transactions for 20 days on retail transactions. Cash advance, balance transfer and instalment payment plan programmes are excluded from interest-free period. Finally, consumers also subjected to late payment charges minimum of RM5 or 1% of total outstanding balance, whichever is higher, up to RM50 if they fail to make payments before due date. If you have problem to settle your credit card debt, the best solutions is to cut the card and stop using it. 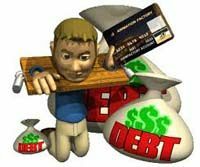 I created “Credit Card Debt Calculator” to estimate duration to settle of the debt & total interest you have to pay the banks. A Malaysian developer has created a free Credit Card Calculator app for smartphone users. The app is pretty handy to make comparison between 2 different payoff strategy or rate. You can see how much you can save or how much you need to pay for the interest with this credit card calculator app.